Why is this 4,500 year-old purse covered with a hundred dog teeth? Ladies, if you're thinking of accessorizing and bringing back that retro look, you may be interested in a recent archaeological discovery made in Germany: Excavators working to uncover a Stone Age site near Leipzig have found a rather bizarrely ornamented purse – one that's studded with a hundred dog teeth. And according to the archaeologists, "It seems to have been very fashionable at the time." The purse was found at what is believed to be an ancient grave site dating back to about 2,500 B.C. To date, the project has uncovered evidence of Stone and Bronze Age settlements, including more than 300 graves, hundreds of stone tools, spear points, ceramic vessels, bone buttons, and an amber necklace. 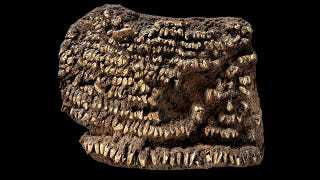 As rare as the dog-tooth handbag may be, canine teeth are actually fairly common in Stone Age northern and central European burials, [archaeologist Susanne] Friederich said. In fact, the sheer numbers of teeth in graves around the region suggest dogs were as much livestock as pets-the purse flap alone required the teeth of dozens of animals. In other area Stone Age burials, dog and wolf teeth, as well as mussel shells, have been uncovered in patterns that suggest that corpses were covered with studded blankets, which have long since disintegrated, Friederich said. More commonly, though, dog teeth are found in hair ornaments and in necklaces, for both women and men. Given that dog's teeth were all the rage back then, it's difficult to ascertain the exact function or nature of the purse. It very well could have been something "fashionable", or an item used for practical or ceremonial purposes. One thing's for sure, though, it's pretty damn cool.